So what makes a Big Green Egg so special? Many of you have heard about the egg or have seen them in our store, but are they really worth the money? The Big Green Egg is the grill of a lifetime and will never corrode or rust through like some gas grills. The heavy duty ceramic parts are designed to never break and, if they do, they are warranted and replaced for free. This grill will never go out of style and most importantly can cook whatever your taste buds desire! The Big Green Egg offers the versatility to grill, sear, smoke, and bake with the best of them. Feeling like a big juicy steak that is charred to perfection? How about some pork shoulder that has been slow cooked for hours and falls apart with the use of a fork. Or maybe a homemade pizza pie that has been baked to a perfect crisp? The Big Green Egg can do all of these things, and more, thanks to three critical components. 1) hardwood lump charcoal is used to create intense heat and smoky bbq flavor, 2) a heavy ceramic exterior that holds heat even in the coldest days of winter, and 3) a huge assortment of BGE quality accessories to help you redirect heat, roast, sear, etc. 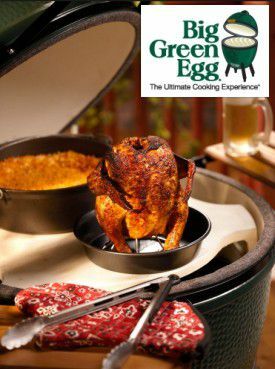 For more information on the Big Green Egg and what it is all about, please visit our brand page, seen here.